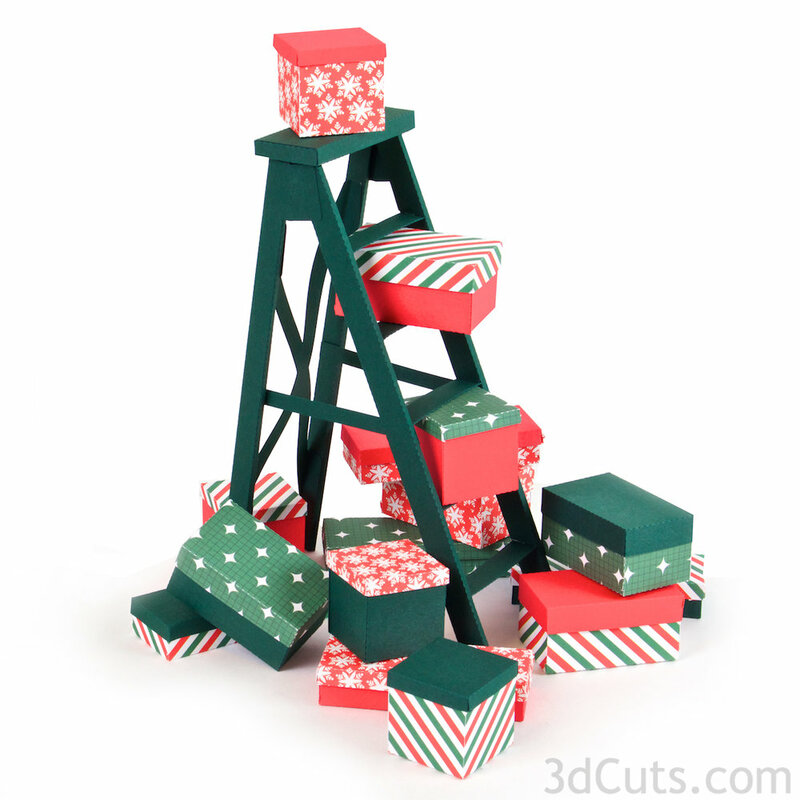 This tutorial is for the assembly of the Decorating for Christmas Ladder files designed by Marji Roy of 3DCuts.com. It includes the building of the ladders, tiny presents, lights and star. It is perfect as a mantle or shelf decoration or as a centerpiece. 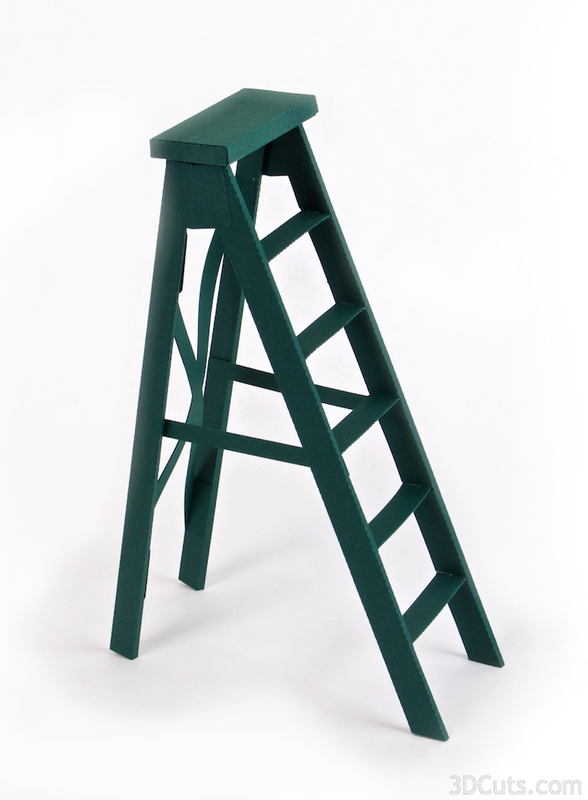 The ladder is about 9" tall. 8.5 x 11" card stock - I used the 65lb Cardstock from Recollections. Each Ladder takes 2 sheets. For the presents I cut five sheets of card stock, 1 red, 1 green and 3 of tiny Christmas prints. The lights requires 1 sheet of black and colored scraps. Yellow for the star and kraft for the corrugated box. Note: This ladder assembly is orange. I created it for Halloween but the assembly is the same. I would choose a different color for Christmas. The ladder is now complete. It can be used for many creative projects - not just this one. 6. Add details- the cardboard box on top. Which of the details you include is up to you. The download includes presents, lights, card board box and star. I like the idea of the box on top looking like the storage box so I cut it out of kraft colored card stock. Fold on all the dotted fold lines. The 4 fold lines around the bottom and the 4 tabs all get folded in toward the inside. The 4 top folds all get folded out - in the opposite direction. Apply a strip of Sor-Tape adhesive to the out side of each of the 4 corner tabs. Peel the backing from the Scor-Tape on each corner and press in place. Repeat for all 4 corners. The cardboard box is complete. Fold both of the Stars on the dotted fold lines. The short lines will be valley folds and the longer lines will be mountain folds but first just fold everything. Once it is folded you can are arrange the mountain and valley folds to make it a star with relief. Do this to both the two star pieces. Put a glue dot at the top and bottom of the star and glue a toothpick as shown on the inside of the star. Place a glue on each of the five tips including on top on the toothpick, plus one on top of the toothpick where it crossed the bottom of the star. Adhere the second star over the first matching tips but working to keep some 3d puffiness to the star. 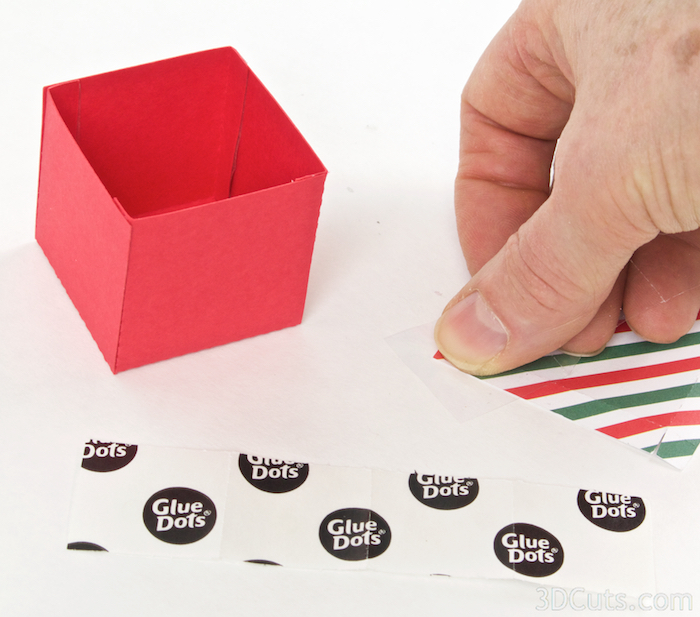 Adhere the str into the corner of the corrugated box using either hot glue or glue dots. 7. Add details- Make the presents. Identify the top and bottom that match. There are 3 sizes included in the download. Fold inward on all dotted line on both the top and bottom. Apply Scor-Tape to the outside of all the 1/4" side tabs. Peel the backing off the Scor-Tape are carefully adhere each corner. Glue dots work well as an adhesive on the covers. Apply a glue dot to the tab on the outside of each of the 4 corners. Fold the corners together and adhere to make the box lid. Using the same steps, assemble all the other boxes. I mixed the top and bottom card stock prints to create variety. The number you create depends or your display. If adding the lights, I used fewer boxes. If creating the ladder with just the presents I made 15 boxes. 8. Add Details - Makes the lights. Cut the light bulbs from at least four different bright colors. This is a perfect project for the Xyron for applying adhesive although other adhesives works as well. The double colored lights are designed to be folded around the black bulbs on the string of lights. Place it so none of the black bulb shows. Fold it over and adhere it in place. I applied them in a pattern of red, blue, green, yellow. Cover all the lights on the strings. Adhere the corrugated box to the top of the ladder. Adhere the strings of lights so they are coming out of the corrugated box and cascading down the ladder. Use a couple of glue dots to hold in place. Arrange a few gifts around the base. Make and arrangement with just the ladder and presents. Be creative and use the pieces in your own arrangement.